Home > Understanding > What Happens When an Aneurysm Bleeds? Blood from an Aneurysm can leak into the CSF (cerebrospinal fluid) in the space around the brain (subarachnoid space). The pool of blood forms a clot. Blood can irritate, damage, or destroy nearby brain cells. This may cause problems with body functions or mental skills. Blood from a torn aneurysm can block CSF circulation leading to fluid buildup and increased pressure on the brain. The open spaces in the brain, called ventricles, may enlarge. This is known as hydrocephalus. Hydrocephalus is a condition characterized by excessive accumulation of fluid in the brain. It can make a patient lethargic, confused, or incontinent. To stop fluid buildup, a drain may be placed in the ventricles. This removes leaked blood and trapped CSF. 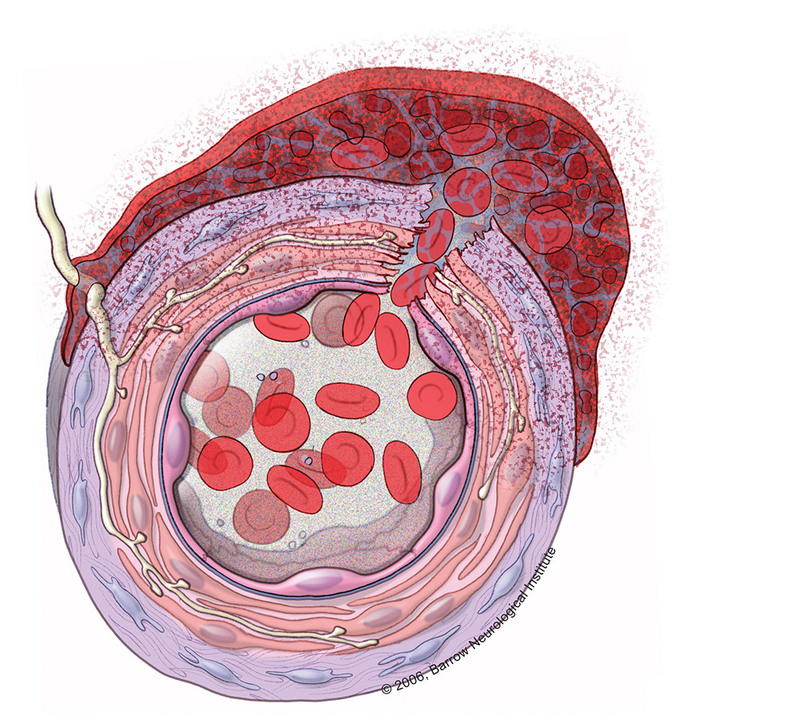 Narrowing of the blood vessels can occur within the few days after an aneurysm ruptures. When not enough blood is supplied to the brain, a stroke may result. This can create a problem called vasospasm. A section of the arterial wall is shown that represents the wall of a brain aneurysm that has just ruptured. Blood gushes from its normal compartment in the lumen of the blood vessel through the ruptured wall and into the subarachnoid space. There, it forms a clot which contains many red blood cells and, eventually their breakdown products, especially oxyhemoglobin. These products generate free radicals, which damage cells in all layers of the blood vessel wall, including the endothelium, smooth muscle, and adventitia. In the adventitia, fibroblasts and nerve fibers are damaged. A brisk inflammatory reaction follows. Overall, the blood vessel overcontracts, the lumen shuts down, and local cerebral blood flow is impaired. The vasospasm progression over a 15 day period. It is thought that the blood from a ruptured aneurysm is irritating and causes the nearby blood vessels to spasm and narrow. This decreases blood flow to the brain can result in damage or even brain death. Doctors are sometimes able to predict if the patient has a higher chance of spasms and how severe the spasms will be based on the extent of the bleed. About two-thirds of patients will develop vasospasm after bleeding into the subarachnoid space and it can be fatal in 7% of patients. Vasospasm typically develops 5-8 days after the initial hemorrhage and can last as long as 2 to 3 weeks. The effect on the patient can be mild, moderate, or severe depending on the degree of vasospasm and the patient’s responsiveness to treatment. To treat vasospasm, medicines are often used to elevate blood pressure. Subangiographic vasospasm is the type that cannot be detected by the imaging method for vasospasm detection known as cerebral angiography .This means that vasospasm is actually occurring at a physical level, but we just can’t see it due to limitations of available imaging methods. Specifically, either the narrowing is too mild to detect, or the spasm is happening in a part of the arterial tree which is most difficult to look at using angiography – this part involves the smaller of the brain arteries. The patient may or may not be “clinically affected” by subangiographic vasospasm so a physician may or may not be able to detect its presence. Surprisingly, some patients with subangiographic spasm still suffer symptoms that, to the exclusion of all other causes, are thought to be due to the vasospastic process taking place in their brain arteries, which is beyond the level of angiographic detection. Angiographic vasospasm is the type that can be detected by cerebral angiography. The patient may or may not be clinically affected by angiographic vasospasm. Generally, it is thought that if one can detect spasm angiographically then the patient should be affected in such a way that it can be picked up by a physician at the patient’s bedside. However, there are exceptions to this rule. The reasons for this are unknown, but may relate to differences between individuals in terms of the unique capacities of their brains to tolerate the same degree of arterial spasm, or to differences in the “road-maps” of their brain circulation (e.g., presence of back-up routes of blood supply or “collateral circulation”). In general, in vasospasm due to aneurysmal bleeding, the vasospastic arteries (if detected) tend to be close to the site of the aneurysm rupture. However, more distant or remote arteries can also be affected in a “diffuse” or “generalized” manner. 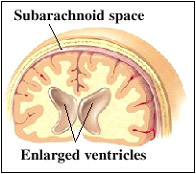 Animation illustrates how hydrocephalus increases ventricle size while the CSF space decreases. When an aneurysm rupture results in bleeding in the space between the brain and surrounding tissue (subarachnoid hemorrhage) – most often the case – the blood can block circulation of the fluid surrounding the brain and spinal cord (cerebrospinal fluid). This condition can result in hydrocephalus, an excess of cerebrospinal fluid that increases pressure on the brain and can damage tissues. Too much cerebrospinal fluid puts a harmful amount of pressure on tissues in the brain – treatment is needed to release this pressure. Hydrocephalus can be congenital (present at birth), or develop later in childhood or adulthood. 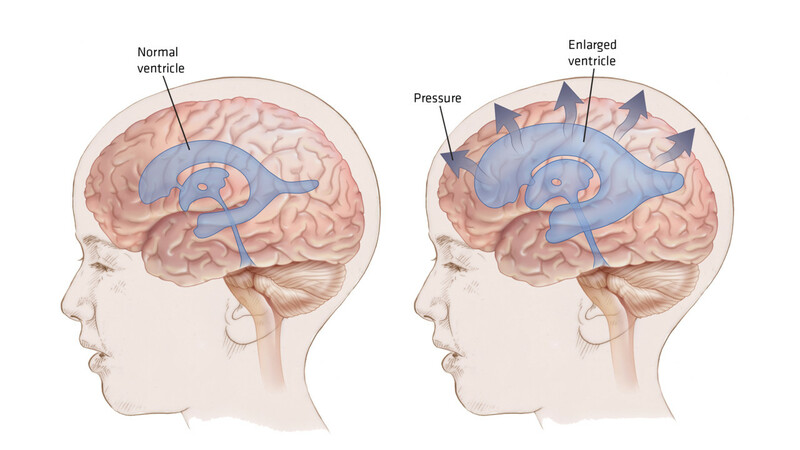 Normal pressure hydrocephalus (NPH) is a type of hydrocephalus, which usually develops in people over 60, because the drainage of the CSF gradually becomes blocked. Hydrocephalus may also be communicating or non-communicating. Communicating hydrocephalus occurs when the flow of CSF is blocked after it leaves the ventricles. Non-communicating hydrocephalus (obstructive) is the result of the flow of the CSF being blocked along one or more of the narrow passages connecting the ventricles. Unfortunately the causes of hydrocephalus are still not well understood. The condition may result from inherited genetic abnormalities or developmental disorders. Other possible causes include premature birth complications such as intraventricular hemorrhage, meningitis, tumors, traumatic head injury, or subarachnoid hemorrhage, which all block the CSF from exiting the ventricles. Symptoms of hydrocephalus vary with age, disease progression, and individual differences in tolerance to the condition. In infancy, the most obvious indication of hydrocephalus is often a rapid increase in head circumference or an unusually large head size. Other symptoms may include vomiting, sleepiness, irritability, downward deviation of the eyes (also called “sun setting”), and seizures. Older children and adults may experience different symptoms because their skulls cannot expand to accommodate the buildup of CSF, unlike an infant’s skull which can expand to make room for the buildup of CSF because the sutures have not yet closed. Symptoms may include headache followed by vomiting, nausea, blurred or double vision, sun setting of the eyes, problems with balance, poor coordination, gait disturbance, urinary incontinence, slowing or loss of developmental progress, lethargy, drowsiness, irritability, or other changes in personality or cognition including memory loss. Symptoms of normal pressure hydrocephalus usually progress over time and tend to include problems with walking, impaired bladder control leading to urinary frequency and/or incontinence, and progressive mental impairment and dementia. Because some of these symptoms may also be experienced in other disorders such as Alzheimer’s disease, Parkinson’s disease, and Creutzfeldt-Jakob disease, normal pressure hydrocephalus is often incorrectly diagnosed and therefore, treated improperly. Doctors may use a variety of tests, including brain scans such as computed tomography (CT) and magnetic resonance imaging (MRI), a spinal tap or lumbar catheter, intracranial pressure monitoring, and neuropsychological tests, to help them accurately diagnose normal pressure hydrocephalus and rule out any other conditions.